This TF-104G two-seater crashed near or at homebase Bandirma due to an engine failure just after takeoff. Both pilots Hv. Plt. Kur. Bnb. Ihsan Aksoy (38) and Hv. Plt. Ütgm Kadri Kurt (26) were both tragically killed in this accident because it was too late for them to eject. The pilot tried to turn the aircraft to avoid that it would crash into the village. 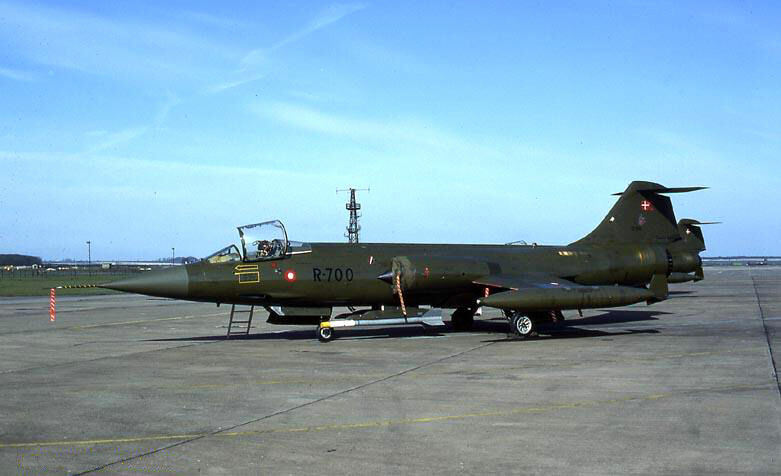 (USAF serial 63-12700) It crashed near Aebeltost into the Kattegat. Pilot Hav. Sl. J.O.L Pedersen was sadly killed in this accident. It happened during an air defense exercise when it crashed in the Kattegat, 10 km east of helmet shortly after the pilot had ordered his wingman to return to Aalborg Air Base due to fuel shortages. This wingman had then tried to get radio contact with R-700, but without response. 2 hours later the SAR team detected an oil slick at sea. The cause was likely a fuel leakage. 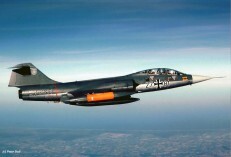 It crashed West of Bornholm, Denmark into the Baltic sea during a low level-sortie. A birdstrike (by a Gull) caused an engine-failure and pilot KptLt Frank Genge ejected safely. 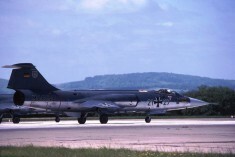 It crashed 12nm NW of RAF Gutersloh after a mid-air collision with an RAF HarrierT4 (XW933/AQ of 3sq). Harrier pilot SqnLdr A.B. Cogram (frontseat) was killed while the the 2nd pilot Fg Off K.B.McCann could select his ejection-seat. He had major injuries but was ok. 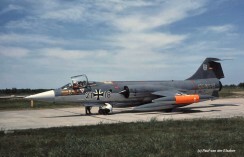 The F104 pilot KptLt Ralf Gorath ejected safely also. 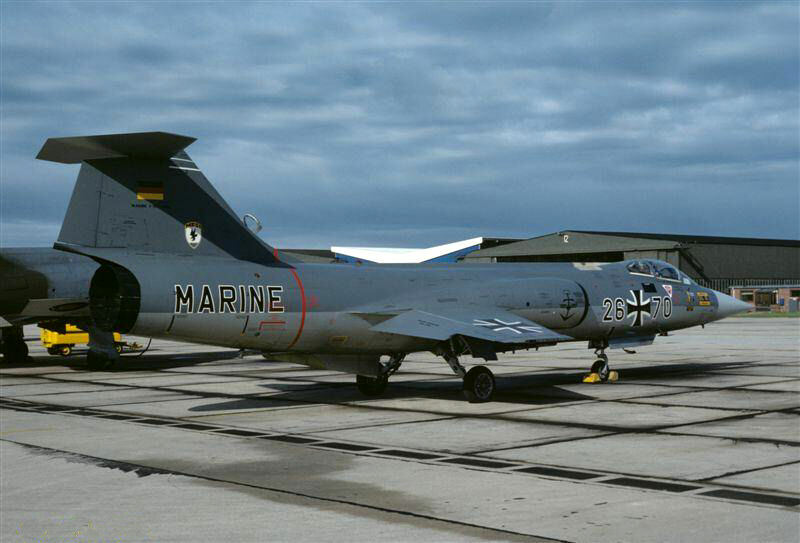 That morning the F104 was on a low level visual navigation flight. Approaching the area to the NW of Gutersloh, the pilot was consulting his map when he felt an impact and sensed a slight retardation. Suspecting that he might have suffered a birdstrike, he climbed and turned right onto a heading for RAF Gutersloh whilst declaring an emergency on their approach freq. Some 20 to 30 seconds later the aircraft's fuel-lowlevel and fire-warning lights illuminated and the pilot then saw that the aircraft's starboard wing had been damaged. He transmitted that his plane was on fire, and ejected succesfully appr. 12nm N of Gutersloh. He was subsequently rescued by helicopter and taken to RAF Gutersloh where he was treated for slight injuries. From the cockpit of the Harrier the story was as follows: Having completed a visual scan from left to right encompassing the area 120 degrees either side of the aircraft's nose, he was just returning his scan to the front when he saw the F104 appear in his 10'o'clock position at 50 yards range and slightly high: There has been no warning call from the rear-seat pilot. 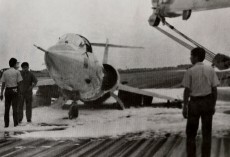 Although a collision appeared unavoidable, the pilot bunted and rolled the aircraft to the right to attempt to miss the F104. Almost immediately there was a loud bang as the two aircraft collided, and the Harrier pilot instinctively ducked as the F104G passed above him. 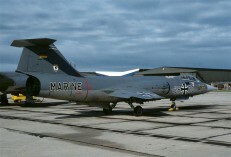 The front rear-seat pilot was instantly killed by probably the F104 starboard wing. The pilot felthis aircraft moving violently to the right and experienced a momentary loss of vision. Shortly afterwards his vision returned and he realised the Harrier was a steep descent, not responding to control-inputs. He ejected but suffered compression-fractures to 2 vertebrea. Afterwards it was found out that the aircraft had approached one another along aline of constant bearing and from backgrounds against which their camoflage was at its most effective. (Both aircraft lacked High intensity Strobe Lights). The IFS owns a copy of the official accident report. Due to technical problems it made a successful emergency-landing at Leeuwarden AB. It was repaired at Leeuwarden Air Base and departed back home on March 4th. 1985. Beneath a photo taken in 1985, thanks to Peter Doll. 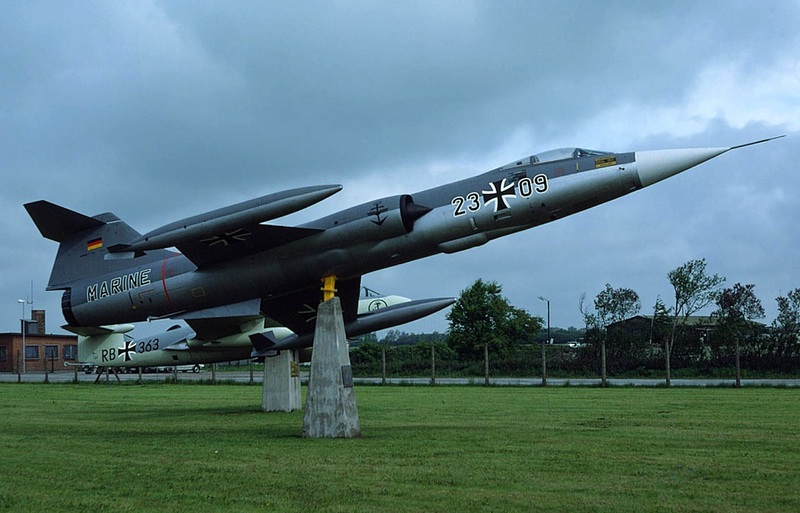 (USAF serial : 62-12341) It crashed into the 'Tannis Bucht' near Tversted. Pilot Hav.Fl. Henning Andersen was sadly killed. It came down into sea 20km N of Hirtshals. The R-341 was one of two aircraft flying their mission from Aalborg. When returning back and preparing for the landing at around 4500ft , the R-341 dissapeared from the radar. The wreck was later found in sea and the cause of the accident is unknown. This day this Starfighter was lost in an accident due to an unknown reason. 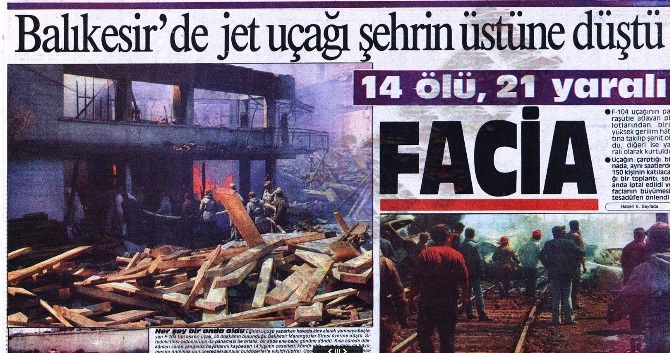 It crashed at Polatli (about 70 km east of Ankara). The pilot was ok. It crashed into the Northsea, near Helgoland, Denmark. 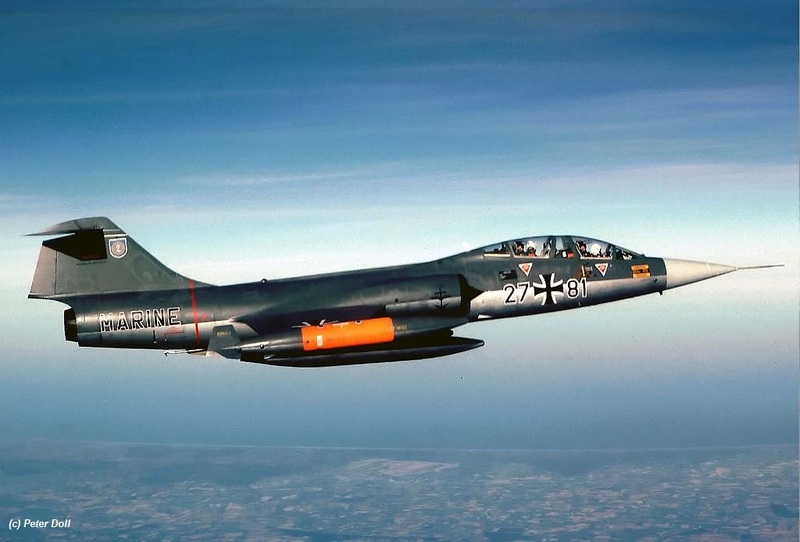 After the aircraft fired a LFK AS30 Kormoran missile its J79 engine stopped and the pilot OltzS Reinhard Dresbach decided to use his seat and was gladly unhurt. Beneath a photo taken during Best Focus exercise in June 1980. 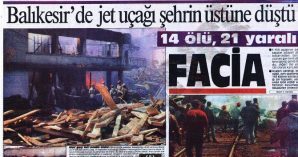 This two-seat Starfighter crashed on a crowdy street in Balikesir killing 9 civilions on the ground and one of its pilots. Both pilots ejected but Hv. Plt. Yzb. 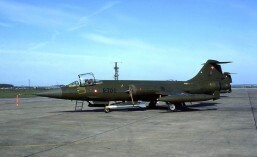 Ahmet Özcan (32) was sadly killed due to a collision with on a high tension electricity line, not in the crash of this F-104 . 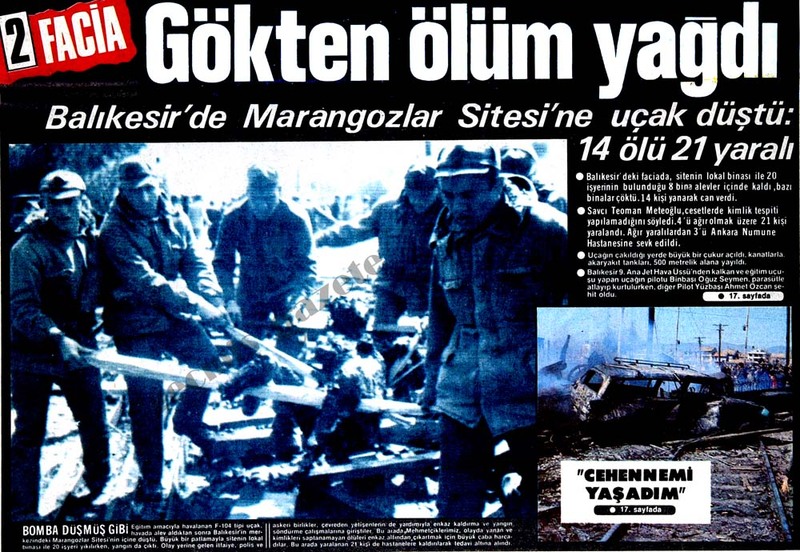 The other pilot, Major Oğuz Seymen was safe. The cause of the accident was "Electrical equipment malfunction of the stick" and the aircraft heading the ground vertically. Both pilots emptied their remaining fuel in the air to prevent more kills on the ground. 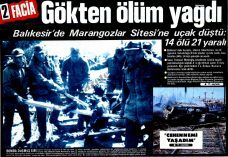 Beneath some news paper articles provided by Bekir. (USAF serial: 63-13260) After an interception exercise with a wingman it made an emergency (belly) landing at CCK AB after its gear malfunctioned (did not lower). Thanks to provided foam on the runway and both tiptanks the damage was small enough to have it repaired soon after. Pilot by TIAN Ding Zhong was unhurt. It crashed near Kepsut, not far from homebase Balikesir, due to an unknown reason. The pilot Capt Gültekin Basargan (31) was sadly killed. It crashed near Aksehir due to likely a technical failure. the pilot could eject in time and was ok. 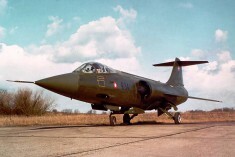 This Starfighter was written off when accidentally during taxing (possibly at Hellinikon AFB) Tip Tanks were jettisoned and its rear fuselage went into flames. Gladly both pilots escaped unhurt but the back of the aircraft sustained quite some damage and it was decided not to repair it due to economical reasons. The aircraft was declared wfu and stayed at Hellicon AB until the summer of 2004. Beneath a photo showing the aircraft on the scrapyard of Agrinion around 2009. This day this former Dutch Air Force Starfighter, belonging to the training squadron at Murted, was written off due to an unknown reason near Bolu, Turkey. pilot Sehit Hv Plt Yzb. H. Erhan Basmaci (30 years old) was sadly killed in this accident. This Starfighter crashed 6 miles E of Ithaki island after encountering an engine fire. Both pilots 1st Lt’s H. Apostolopoulos and G. Dritsakos ejected safely. 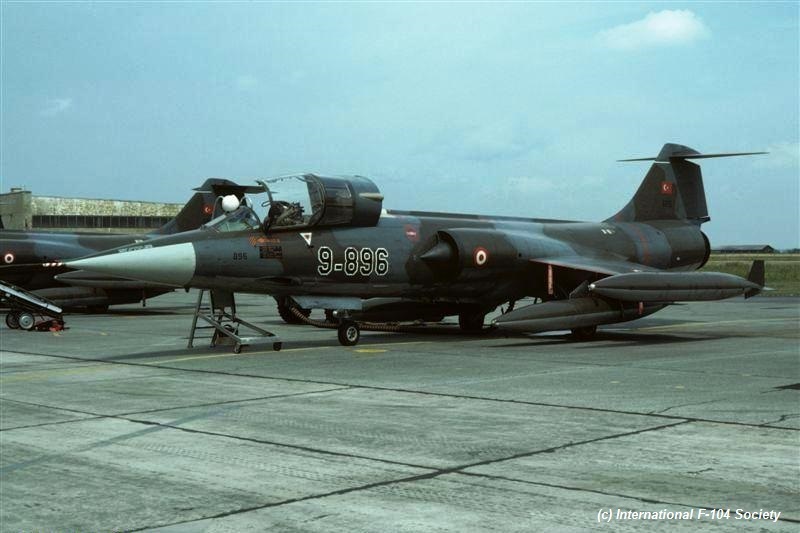 This F-104S Starfighter crashed near Istanbul due to an unknown cause. The pilot Lt T. Tamer Polat (25) was sadly killed. 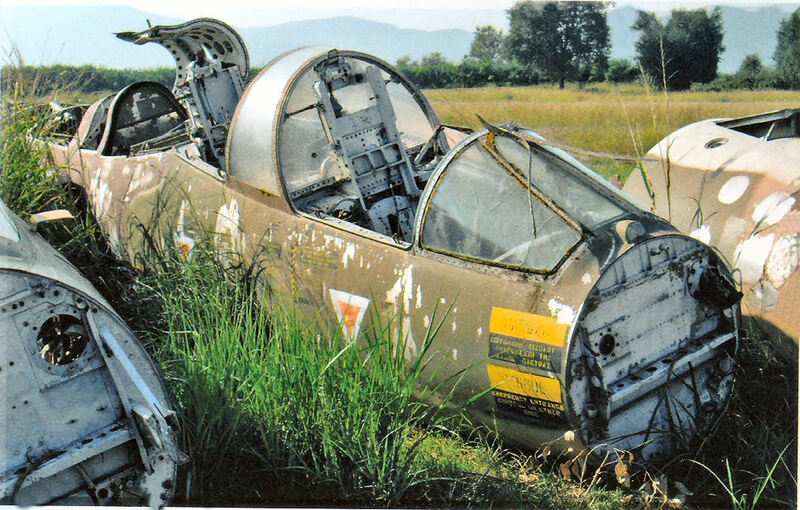 This ex Norwegian Air Force Starfighter crashed near homebase Balikesir after encountering an engine stall. The pilot was safe thanks to his ejection seat. 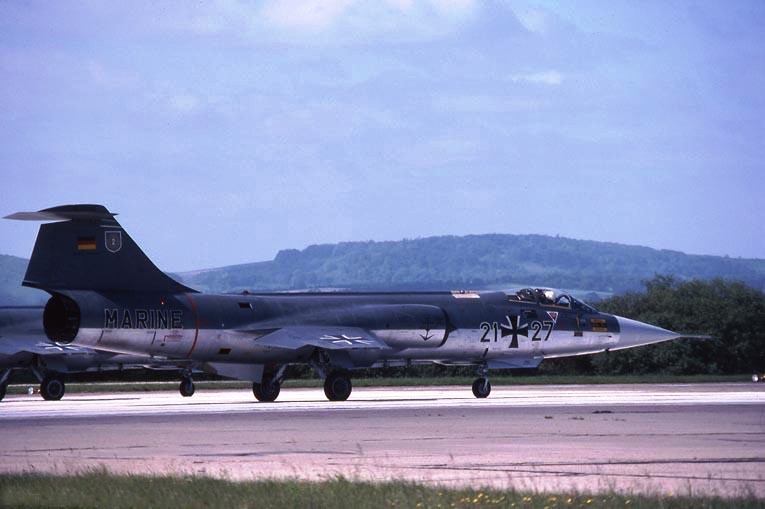 This F-104G crashed at the Suippes-range, France near Chaumont when it encountered an engine-failure during shooting-exercises. Pilot Maj Aarne Kreuzinger-Janik ejected safely. 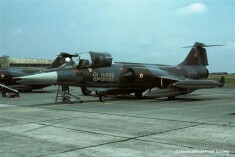 This day this Starfighter crashed at 19.45 PM into sea near Chieti, 2nm from the coast of Torino di Sangro (CH). The 5Stormo pilot, Capt Edoardo Costa, just got this aircraft from 9Stormo at Grazzanise to take it over to 5Stormo at Rimini. During this delivery flight the aircraft crashed and the pilot was sadly missing later on declared killed. It is very likely the aircraft still carried its old code "9-32" but could also have been uncoded. 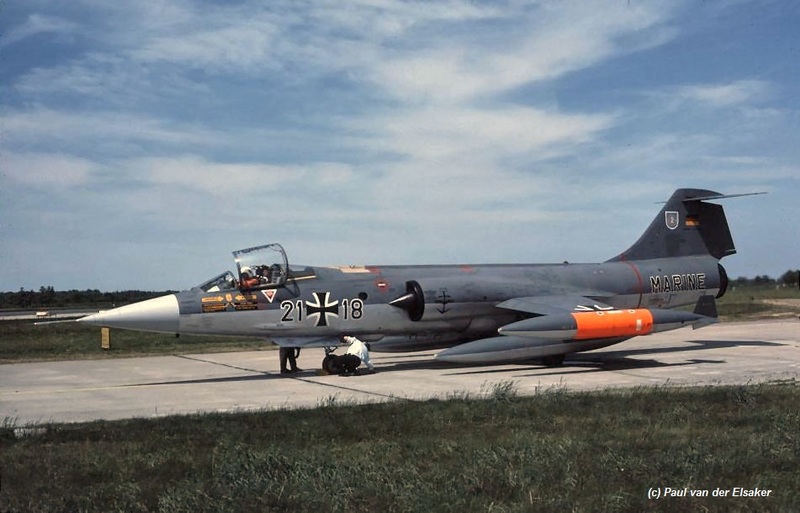 This aircraft was not written off during an accident but declared written off after an emergency landing at NAS Eggebek this day after sustaining a severe bird strike during a low level mission (450 KIAS at 200ft MSL) over the the Baltic Sea. It landed safely but was declared damaged beyond economical repair (damage to inlet and engine) and later on it was used for spare parts. Officially withdrawn from use and struck off charge on February 3, 1986 and in April put on display guarding the gate at Eggebek as seen on the photo beneath. (USAF serial: 56-822) This aircraft, based at Ching Chuan Kang AB, crashed in Fenyuan, Changhua. Gladly pilot Li Chun-Bin could eject safely. After ACM training, during landing, the aircraft encountered mechanical malfunction and pilot lost control and ejected.